There’s drumming going on continually the whole time they’re playing…They’ll play it for hours. It’s really hypnotic; I mean you won’t even be able to take your eyes away. A fast-paced gambling game played with polished, painted sticks was popular throughout southeast Alaska and the northern coast of British Columbia. 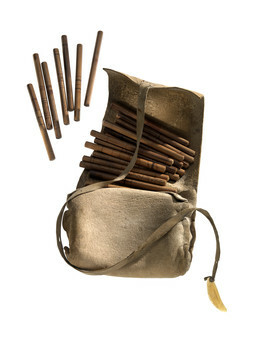 Chief Sheiyksh (or Shakes) VI of Wrangell may have owned this set of 66 sticks, which were kept in a caribou-skin bag. The unique design on each stick represents a dragonfly, seagull, killer whale, wolf, bear, raven or other creature. Players shuffled the sticks under shredded cedar bark and opponents guessed the location of the “bait” or “devilfish” stick. The rules of play varied from place to place. Clarence Jackson: Oh, Wrangell, Chief Shakes. Rosita Worl Yes, he’s from Wrangell. . . .
Clarence Jackson: Naanya.aayee that’s Wrangell. Naanya.aayee family of the Stikine, that’s Charles Dewitt. But they are Kaagwaantaan [Eagle Wolf Clan], Chief of the Chilkat tribe living at Klukwan, so maybe it was a gift. They said the fishermen used to gamble when they’d go out fishing. In the summer, they’d go out for a week or two. And they would seine enough to fill up a scow, one set every two days or one day. And the scows must have been small, because the ones I saw held an average of 30,000 fish. But they filled up the scows, and then they sat around for a day and a half and that’s what they did. And sometimes they gambled away all their groceries. Delores Churchill: He may have won that too, you know. Aron Crowell: So how was this game played? Delores Churchill: I saw old people play it when I was a child, and they counted out the bundles, like so many people were playing it. Delores Churchill: Yes. And they just rubbed it [rubs hands together] – it depended on how many people were playing – and then they would each be given a bundle. And they would bet how many of those lines were going to face forward. And that’s how they did it. They’d just go like that [rubs hands back and forth] and just drop them. Clarence Jackson: Drop it down, like dice. Delores Churchill: Yes. And then they would look at the numbers on how it was done. But I don’t know how the Tlingits play, do you Rosita? Clarence Jackson: Same thing. See the lines are different on the sticks. I’m sure it was the same. I heard them talking about it, and then they used bones too. They had a bone bag that they used like dice. Donald Gregory: There’s 61 of them. Clarence Jackson: That means six of us could play. Rosita Worl: They usually – at least in the northern area where Anna and I are from – they would have two teams, and they face each other. And they’re kneeling, and they have drummers behind them. Clarence Jackson: Oh they sang. Rosita Worl: Yes. There’s drumming going on continually the whole time they’re playing. And it’s kind of like, the way I always describe it is like ‘button, button, whose got the button’ kind of thing. They’ll play it for hours. It’s really hypnotic. I mean you won’t even be able to take your eyes away. The drum is just going on the time [hits hand repetitively on table and sings in Tlingit]. I mean it’s just hours of it. Delores Churchill: . . . It would be funny though because they would be telling jokes about one another as they did it. That was what was really funny. And sometimes some of them had the string and they were telling string stories. So they were distracting the people who were going to do it, so it was kind of like ‘Hey you know, you’re not going to win.‘ I don’t know if anybody did string stories here, but they would have the light real low so you could see the shadow of the string too. I think what is really, what we’re forgetting, and I noticed Peter does it though, is that they were really dramatic when they were talking you know. Like when they said they shot you’d go [makes gunshot noise]. . . . I noticed how the real old people talk, they didn’t just speak. Clarence Jackson: Isaac Kasaan was really great. He acted out how the deer fell, how the deer floated when they shot it. He’s the last one I know, Isaac. He really used all the motions. Donald Gregory: Some of these have totemic designs on them as well as the lines. . . I see on this one here, it caught my eye because it has a tinaa [copper shield] design in there. And you could just barely see it. I don’t know how they put that design on, if they scrapped it first and then just put some paint in there and that’s where it stayed. But I think whoever had this had loaded—you know how sometimes they have loaded dice—well this one has got, it possibly could have got broken and been repaired, but it’s got a little plug there with two nails holding it in. So when it went down it probably went in one direction every time. Clarence Jackson: Isn’t that something. That is truly amazing. Peter Jack: Maybe that’s how the Chief lost it. Aron Crowell: Donald, I was wondering how they made them so round. They’re perfect. I noticed you rolling them on the table and, they’re perfectly round. Emmons was saying they had a little test or a die that got them precise. Clarence Jackson: That’s interesting, that is a loaded dice. Donald Gregory: That’s the only one I see in there like that. When I looked at the other set that’s over there on the case, it looked like someone had just taken dowels and chopped them and then sanded them. Clarence Jackson: There’s a hole in this one. Donald Gregory: Is there a hole in that? Maybe the lead fell out. Clarence Jackson: I bet that’s what happened, the weight fell out of this one see. That’s why they gave it away maybe. Delores Churchill: Could I read what Emmons wrote on here? “A set of gambling sticks, 66 in number.” And they only counted 61. “66 in number in a certain skin bag that was found in the possession of an old Kaagwaantaan [Eagle Wolf Clan] chief of the Chilkat tribe living in Klukwan on the Chilkat River. The set originally belonged to Shakes, the hereditary Chief of the Naanya.aayee family of the Stikine tribe living in Wrangell. Besides the lines painted in red and black, which gives the sticks their names and their value in playing, some 36 of the sticks are ornamented in conventionalized figures burnt in the wood. These sticks were identified both as to the painted lines and the figures of the old chief of the Xoots Noowu tribe living in Killisnoo, Admiralty Island. Name given to the stick by the painted lines: 1 is a sea gull; 1A is seagull, the picture represents a dragon fly; 2 sea gull’s head; 2A sea gull’s head, the picture represents a crab; 3 sea gull’s tail, 2 specimens; 4 sea gull’s skin; 4A the picture represents a killer whale and a hair seal; 4B the picture represents a wolf figure sitting up; 5 a sea gull in a red blanket border . . . .” It goes on and on so I won’t read it all but I think it would be good.